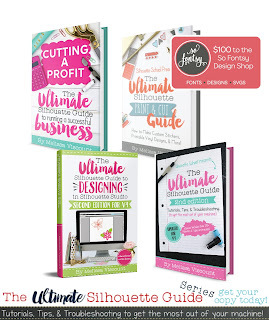 Today I'm thrilled to welcome Cheryl Dewees to the blog. 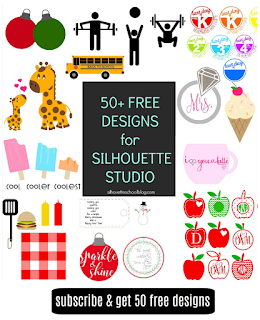 She's been a Silhouette-er and blogger for while and recently she shared with me an awesome Silhouette screen printing project that just blew me away. 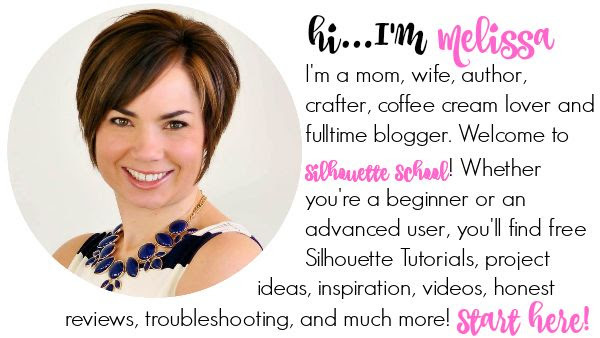 I thought who better to share a tutorial with all of you - than Cheryl so today I'm handing over the blog. 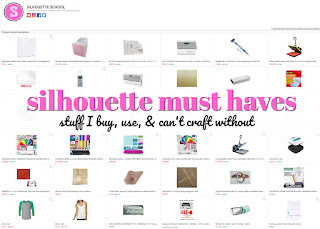 I am constantly amazed at all the uses I find for the Silhouette Cameo. 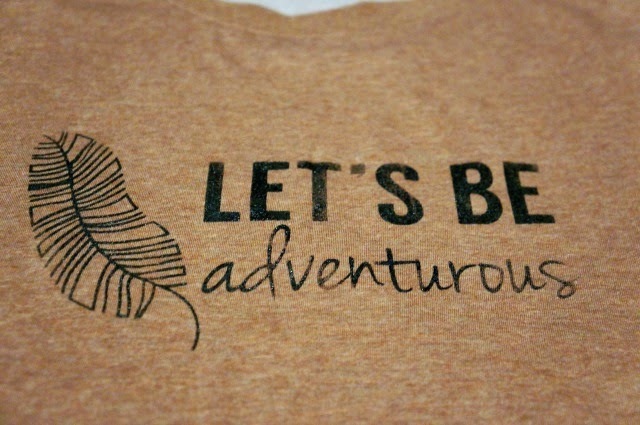 One of my favorite things to do is make shirts for my friends, family, and of course myself! 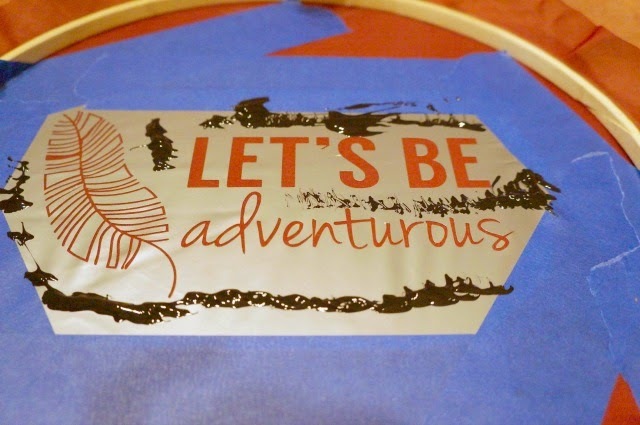 As I was looking around at all the possibilities, I came across a screen printing technique using adhesive vinyl and had to give it a try. 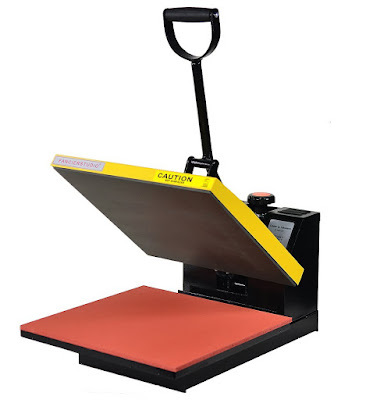 Screen Printing Paint - I bought the Speedball Screen Printing brand. 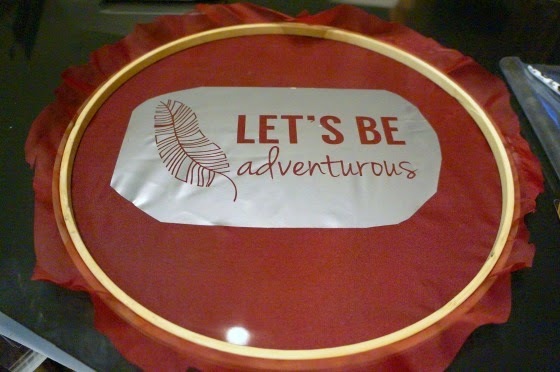 Embroidery Hoop - I bought one large enough to cover the entire front of a t-shirt. Sheer/Thin Fabric for 'Screen' - I used a section of an old sheer curtain panel. Flexible Instrument: I used an old Starbucks gift card instead of a screen printing squeegee. 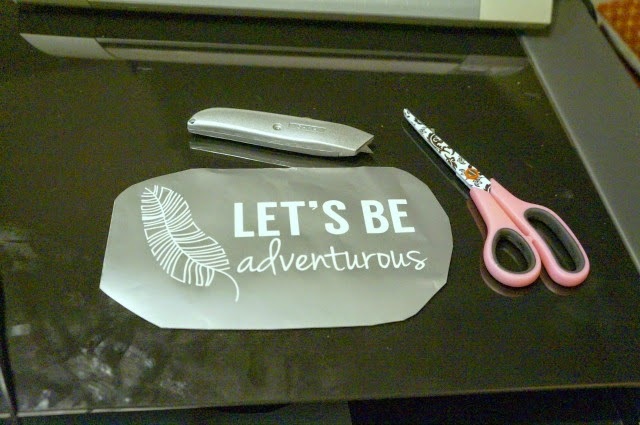 Cut and weed your adhesive vinyl stencil. I used Oracal 651. 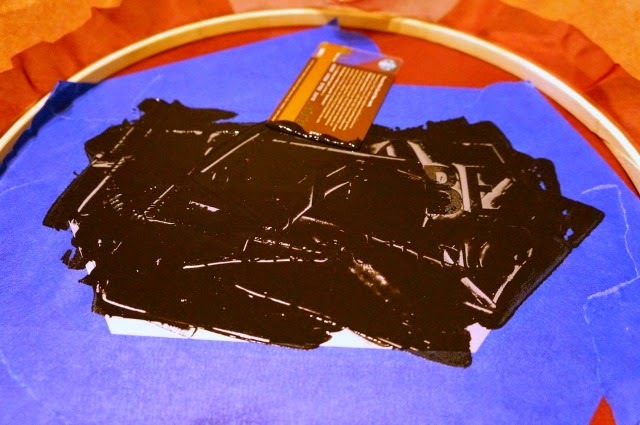 Secure the thin fabric in the embroidery hoop. Pull it tight so that there are no wrinkles. Trim the excess from around the hoop. Flip the hoop and material over so that the thin sheet is laying flat on the surface (not raised up by the hoop). 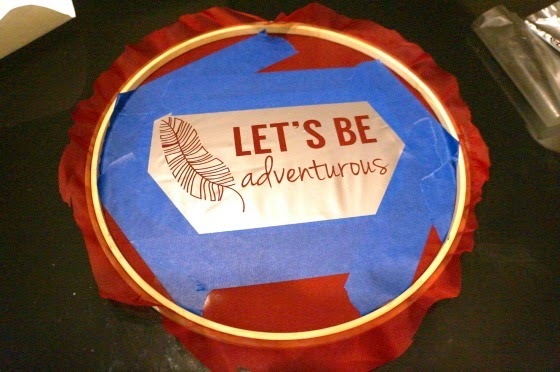 Using transfer paper, transfer the stencil to the material inside the hoop. I found this the most difficult part of the process. I really had to work to make the vinyl stick to the fabric and peel off the transfer paper. 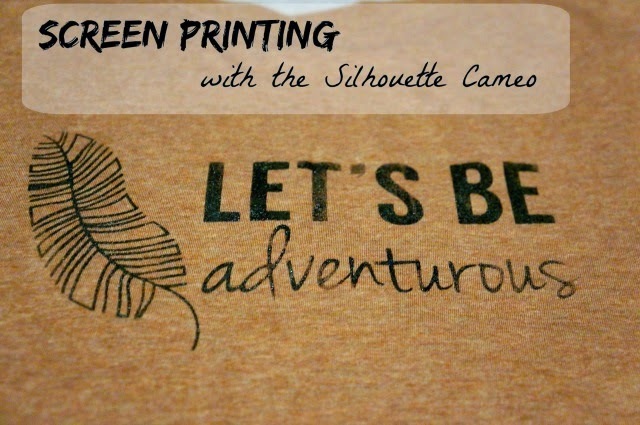 I would suggest using a piece of transfer paper that has been used a couple times already so it is less sticky. Make sure the vinyl is sealed down on the fabric really well. Wrinkles will allow the paint to seep outside of the stencil lines. 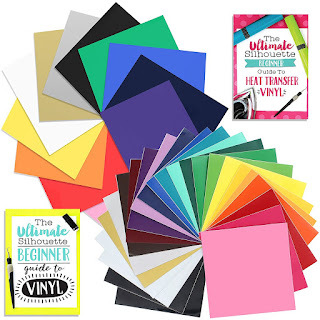 You will also be pressing and scraping across the vinyl with your squeegee or card so the vinyl pieces need to be very secure. 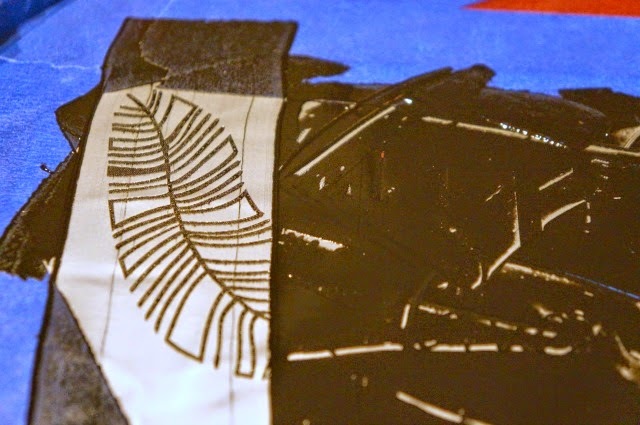 Tape around the outside border of the vinyl with painter's tape. This is to protect your material underneath from getting paint on it. You can cover all the exposed material outside of your vinyl or just create a large border like I did. 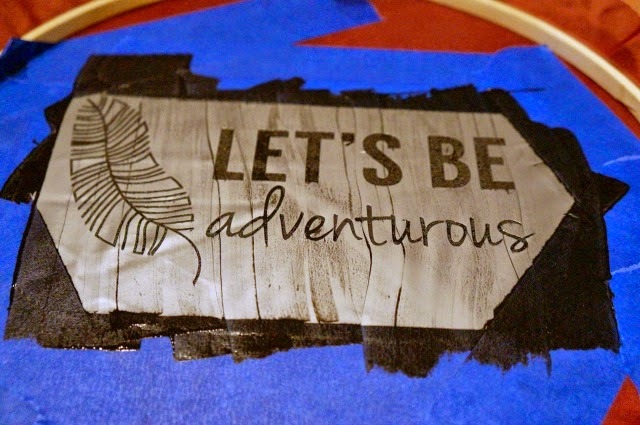 Place the hoop with the stencil flat on top of the material to be screen printed - a t-shirt in my case. I placed wax paper inside the shirt to keep any paint that might bleed through off of the back of the shirt. Dab a little paint around your stencil. And I mean A LITTLE! The paint is very thick and concentrated. A little goes a very long way. Using the scraper, pull the paint into the cut-out portions of the stencil flooding all the sections completely. Then use the scraper to gently, but firmly, scrape away the excess paint until all of it has been removed. I scraped, then added the excess paint back into the paint container. Gently pick the stencil up from the material. Once the paint is dry, iron over the screen print with a hot iron. This sets the paint and will keep it from washing out. I love the vintage-y feel of the screen printing. It doesn't have to be perfect. In fact, I like it better when it's not. Next on my agenda is experimenting with adding one or more colors when screen printing. I tried it using a tutorial that used Modge podge to make the screen. You could wash it and reuse it. Great for when you want to make lots of something. I wonder if the contact paper from dollar store would work in place of the vinyl? Also, can I use the same set up for multiple shirts (use the screen more than once)? Can you re-use this stencil for another t-shirt? I just tried this with the speedball screen frame "thingy" and oracle 631. The ink seeped through the vinyl. I was trying to use my "inexpensive" vinyl as not to waste. I will try again soon with oracle 651. Can you wash your fabric and use again? I love this idea. I have been thinking about this process for a while and have a question. 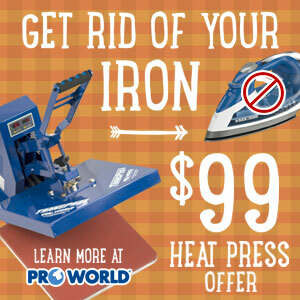 Would freezer paper work if you ironed it on the shirt? I know I will try it both ways. It is a fabulous tutorial. I really love your tutorial. I will try to do it. Thanks so much !!! Omg always wanted to try screen printing I'm also thinking heat transfer vinal would work to us it again and again and again. I had already seen this tutorial on Youtube, and found it clever. Not tried yet but very soon, as I just bought my embroidery hoop. 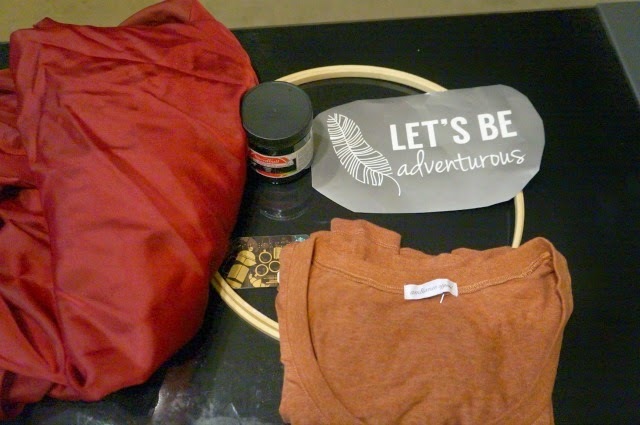 Then an idea came to me : why not using old tights instead of fabric ? It could be strong enough, and elastic is better… It would also be a good way to re—use those with a run ! This is a great little tutorial that I hope to follow. I really want to pop to the shops now and get the materials in to try it! I always love the vintage look which looks absolutely fantastic on the screen printing. Great photos as well, shows exactly what to do which I will need. Gathering masterworks is definitely not a faultless craftsmanship. Be that as it may, the matter of workmanship must be trustworthy. Where you purchase the bit of craftsmanship is generally as vital as what you purchase. How do you clean and reuse the screen?